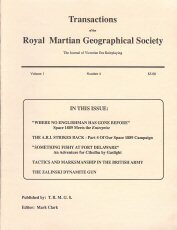 This rather rare accessory for Space 1889 was written by Gary E. Smith of 3W, which did occasional license-produced books for GDW game series as well as wargames. "The government of Her Majesty Queen Victoria asks for volunteers to undertake a secret expedition to the forbidden liftwood groves of the Astusapes Highlands. There, work will be done to help unlock the secrets of this marvelous tree that provides the vital "lift" for the cloudships of Mars as well as Earth. Others (you have heard) have made this type of attempt and failed. Will your expedition perhaps be a successful one? If so, what will the cost be of your success? Or the price for your failure? This module provides the needed charts, tables and major NPC's necessary for high adventure and intrigue on the planet Mars. High Martians, Canal Martians, human adventurers and bureaucratic middlemen; they're all here to assist or hinder your efforts, depending how you deal with them. Carefully, if you're lucky. Cloudship combat is a feature of The Liftwood Conspiracy and the necessary ship charts and statistics for use either with the Space: 1889 or Sky Galleons of Mars aerial rules are included, along with new ships to expand your fleet. No specific date or year has been set for this work, so referees may run it as a stand alone adventure or add it into any on-going campaign. Either way, get your own conspiracy started immediately! The Queen so expects. BONUS: Rescue at Thoth, a mini-adventure of derring-do, is included in this module. Can your players rescue a Martian noble from the hands of religious fanatics without turning the city-state of Thoth against the resident humans? 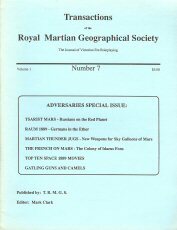 If you can't, the list of sacrifices will grow, and grow, and grow..."
• THE NATURAL RESOURCES OF MARS"
• THE ZALINSKI DYNAMITE GUN"
• THE NATURE OF THE BEAST -The Swampcats of Venus"
• GATLING GUNS AND CAMELS"
"This volume collects issues five through eight of the official fanzine for Space: 1889. PREPARE! For the French, German and Russian Machinations on Mars! THRILL! To the Rancorous Pushti Fruit Controversy! BLUSTER! 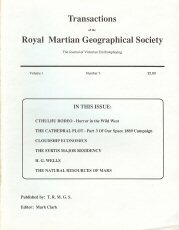 At the activities of Suffragettes on Mars! MARVEL! At The Strongmen of the 19th Century! GAWK! At the Arming of the Adventuress! Corset illustrations for educational purposes only!" * Rules for steam age technologies, including power plants, vehicles and analytical engines. * "Weird sciences" from etheric physics to psychical research, translated into GURPS rules. * A guide to 19th-century history and geography, politics, and customs. * The evolution of weapons and warfare in the real 19th century and in alternate TL5+ settings. * New advantages, disadvantages, and skills, including TL5+ versions of scientific skills. * New character templates to get your players started: the clergyman, the demimondaine, the detective, the inventor, the navy officer, the sportsman, and many others. * Campaign seeds for several alternate steampunk worlds. 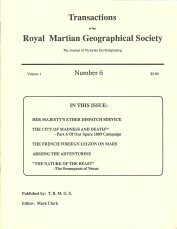 If you love the science fiction of Verne or Wells; if you want a campaign filled with airships, analytical engines, etheric cannon, and other wonders; if you want to dam the straits of Gibraltar, journel to Percival Lowell's Mars, or struggle to free the future from Morlock tyranny . . . then GURPS Steampunk is the book you've been waiting for." 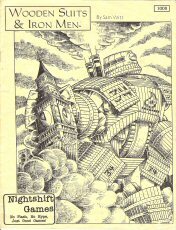 "A bridge for Space 1889: Ever since the demise of [GDW,] I have been looking for a conversion for my Victorian roleplaying. This book fills the gap. I, being an old fart roleplayer, have little time to do conversions. The original rules for 1889 were very simplistic. I wanted more meat. GURPS gives me that extra detail that I crave. The history and color supplied is very good, but of little use to me. The characters and tables were what I needed. Very well written, and to the point. many of these suppliments tend to lean to generalities, but this one focuses on the salient points." ...from Amazon user Cortland Naegelin Jr.
* Weapons, from simple hand-held sticks to energy projectors, in sizes to fit a lady's purse or a battleship's turret. * Vehicles for land, sea, air, space, and time. * A wealth of clockworks, analytical engines, automata, and mechanical men. * Personal gear and large-scale apparatus for survival, protection, medical treatment, scientific experimentation, and other purposes. * New basic technologies including power sources, computation, data storage, and artificial sense organs. * Plus chapters on drugs and chemicals and on exotic lifeforms." "It is 1873. The Victorian Age. But not as you or I learned of it. In this exciting WorldBook for The DUEL System, join in as the fight for what is right is carried through the SteamBot Age! Wonderful technologies that have come to the World too early have been abused by men bent on conquest. Only you can save it! 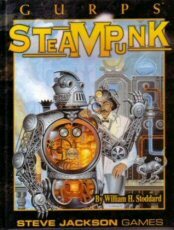 Includes skills & equipment for the SteamBot Age! A complete SteamBot Construction & Combat Section! Clockwork Cybernetics! 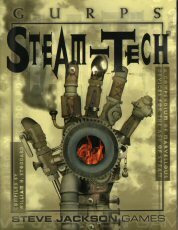 A complete overview of the history of the SteamBot Age! And Lots of Adventure Nuggets! 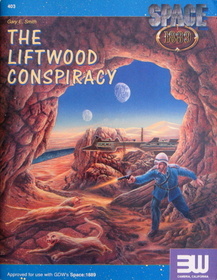 Wooden Suits & Iron Men is the first WorldBook expressly created for The DUEL System. Ownership of DUEL is recommended for use, or this book may be adapted for use with multi-genre game systems."